EFISCEN is a matrix model, where the state of the forest is represented in matrices as an area distribution over age and volume classes. The basic input data for each forest type in EFISCEN consist of area (ha), average growing stock volume per hectare (m3 ha-1) and net annual increment per age class (m3 ha-1 yr-1). The input data are derived from forest inventory data. This inventory data is obtained for different forest types, which can be defined by region, owner-class, site-class and/or tree species. The number of forest types can differ per country and usually depends on the level of detail of the input data. For each forest type that is distinguished, a separate matrix is set up. The initial distribution of area over matrices represents the state of the forest as derived from the national forest inventory data. During simulations, area is transferred between matrix cells and these transitions are determined by natural processes (e.g., growth and mortality) and influenced by management regimes (thinning, final felling, choice of tree species in regeneration,) and changes in forest area. 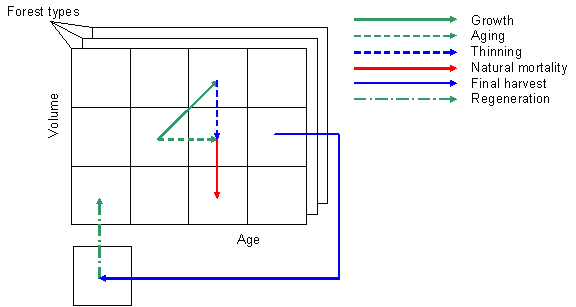 Growth dynamics are simulated by shifting area proportions between matrix cells. In each 5-year time step, the area in each matrix cell moves up one age-class to simulate ageing. Part of the area of a cell also moves to a higher volume-class, thereby simulating volume increment. Growth dynamics are estimated by the model’s growth functions, which are derived from inventory data or yield tables. Natural mortality is simulated by moving a fraction of the area in a certain cell one volume class down. This fraction can be set by the user as a percentage of the growing stock, varying by age class. The actual fraction of the area that is moved down will then depend on the average volume before, and the difference between the volume classes. Only area that has not recently been thinned can be subjected to natural mortality. Harvest regimes are specified at two levels in the model. First, a basic management regime defines the period during which thinnings can take place and a minimum age for final fellings. These regimes can be regarded as constraints on the total harvest level. Second, the demand for wood is specified for thinnings and for final felling separately and EFISCEN will harvest the requested wood volume if available. Thinnings are implemented in the model by moving area one volume class down. Final fellings are simulated by taking the area out of a certain cell. During thinnings and final fellings, logging residues are produced, which can either be left in the forest to decompose or be extracted, e.g. to produce energy. EFISCEN provides information on (future) forest resource structure (tree species, area, age-class structure, stem wood volume, increment, mortality), as well as wood removals and logging residues and stumps from thinning and final fellings for every five-year time-step. With the help of biomass expansion factors, stemwood volume is converted into whole-tree biomass and subsequently to whole-tree carbon stocks. The soil module YASSO is linked to EFISCEN and can be used to provide information on forest soil carbon stocks.